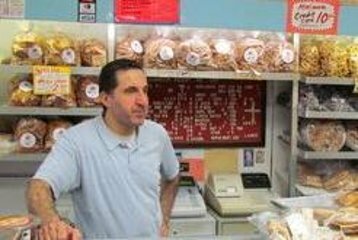 Disfruta de la cultura gastronómica local de Brooklyn mientras visitas algunos de sus muchos restaurantes sabrosos y pequeñas tiendas de alimentos durante este tour de 3 horas en grupo por el vecindario de Carroll Gardens con un guía local. Venga con hambre mientras su expedición a pie se detiene para degustar en una ecléctica variedad de tiendas de alimentos étnicos y locales disponibles para los residentes. Durante su caminata, tendrá la oportunidad de probar todo, desde lugares de cocina artesanal y mercados de Oriente Medio de larga data. Comida de muestra en restaurantes tanto nuevos como viejos. Disfrute del ambiente agradable y la cultura gastronómica de Brooklyn. Recorre el barrio con un guía local. Eche un vistazo de primera mano a la cultura gastronómica del encantador vecindario de Carroll Gardens en Brooklyn durante este pequeño tour a pie por los mejores mercados y restaurantes de la zona. Este vecindario intrigante ofrece un mosaico diverso de antiguas casas de piedra rojiza, restaurantes italianos históricos y mercados de comida del Medio Oriente. Comience su recorrido a pie por la comida de Brooklyn reuniéndose con su guía en Stinky, un mercado artesanal ubicado a lo largo de la calle Smith, a su hora preestablecida. Continúe con su guía en una exploración local exclusiva de los mejores lugares de comida del área. Durante el transcurso de su caminata, tendrá la oportunidad de experimentar siete degustaciones diferentes, que incluyen paradas en una panadería del Medio Oriente, una cafetería italiana y una fuente de refrescos de época, y mucho más. A medida que te mueves entre catas, también obtendrás un resumen del historial del área de tu guía. Al finalizar su recorrido a pie, regresará a Court Street, entre las calles Kane y Degraw, donde tendrá un cómodo acceso a la parada de metro cercana o a los taxis. Mary hannah , was casual had good knowledge of area and history.. tasting were good..Top notch bakery and smoke salmon with cream cheese and bagel killer! We have never done a food tour so maybe this is standard, but we thought we would actually be sitting down in restaurants trying different foods and drinks that reflected the area. Instead we would stand awkwardly in delis and cafes where there was very little space trying to get out of the way of paying customers. The "food" samples included bread, cheese and peanuts which we found odd. The tour also dragged on for 3 hours. There was a lot of standing around and waiting; this tour could have easily been done in half the time. We are big foodies and were really looking forward to this tour, but it ended up being the biggest disappointment of our trip. Our tour guide, Alex, was very knowledgeable about the various neighborhoods in Brooklyn we visited, as well as the 7 venues we visited to try the local flavors. Our favorite stop was the Farmacy, for an authentic egg cream. We highly recommend this tour. We covered a lot of ground on the tour and the guide kept us entertained with history in between venues. The tour was well organised and food was waiting for us when we arrived at each stop. Wonderful tour! Food was great and John our tour guide was knowledgable, personable and very helpful. would highly recommend! A great tour with a very knowledgeable guide, Brian. I enjoyed very much visiting local places and the quality food. Highly recommended. This was a great tour to take on a sunny afternoon in Brooklyn. Our tour guide, Greg, was very informative and a great clear speaker. I and all of my party were full after the tour even with the walking. There was a lot more stops than expected and very generous samples sometimes full size items were given by all the friendly store owners! I will be sure to recommend this to anyone going to NY in the future! This was a very adventurous tour of quaint Brooklyn. John our tour guide was very informative and his passion for the local flavors came through as he guided us to several local establishments offering us wonderful tastes of their wares. Each place has a story That John vividly shared. The selected stops were diversed. Plan to wear good Walking shoes because part of this tour takes you through the various parts of Brooklyn. Great for adults because there is a beer tasting stop. Not interesting enough for young children. Put this tour on your must dolist. Great tour. Our guide Josh was excellent and very knowledgable and enthusiastic. A proper expert in his field.